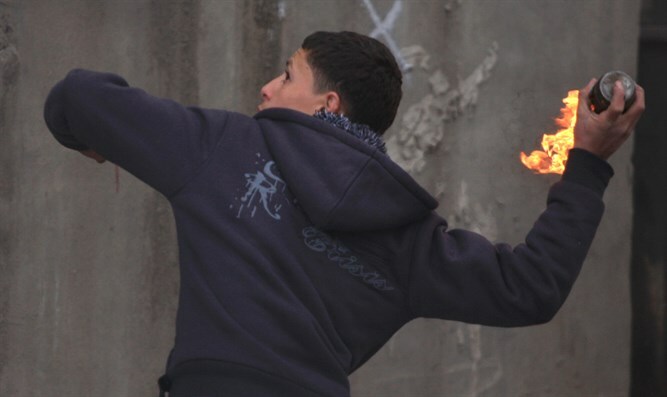 Terrorists throw firebombs on Jewish family's car in attempted murder. Arab terrorists on Saturday evening threw several firebombs at a Jewish couple traveling with their baby in Gush Etzion. The Jewish family had exited the town of Karmei Tzur when they were attacked on a nearby road. Responding to the terror attack, Karmei Tzur's secretariat said, "Unfortunately, the access roads to the town are paved by Arabs from Halhul, and they have not been blocked, despite our repeated requests. The Jewish presence on the Soreq Hill, which controls the road, is destroyed time and again by the Civil Administration." "Apparently, the same one who stammers when faced with agricultural arson in southern Israel closes his eyes to the attempted burning of families in Gush Etzion. We hope that the security system will wake up and respond harshly to these attempted murders, before we pay in blood."